The red, white, and blue confetti floated in the sky and dropped ever so gently on their latest field of dreams. There were hugs, pats on the backs, and family moments with children hugging their hero dads, and wives kissing their hero husbands. There was Bill Belichick, Romeo Crennel, and Charlie Weis, the brain trust of the Super Bowl XXXIX champions embracing for the final time, with Weis off to Notre Dame and Crennel off to Cleveland. Tom Brady follows Joe Montana into the football Hall of Fame. The University of Belichick takes its rightful place alongside Harvard and MIT. And the New England Patriots of the 21st century are established as an NFL dynasty on a par with the Packers of the 1960s, the Steelers of the '70s, the 49ers of the '80s, and the Cowboys of the '90s. Could there possibly be any more doubts? The best team in football has just concluded a grueling three-week exam period in which it faced three completely different challenges from three very good football teams. 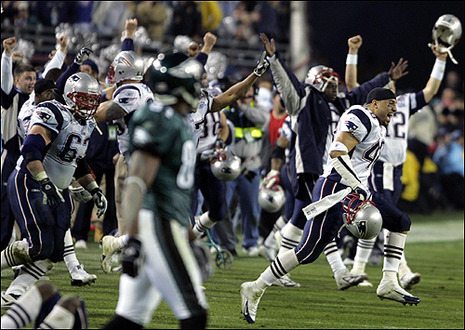 You can make a case -- in fact, I'm going to -- that this was the most difficult postseason task ever presented to a team attempting to win a Super Bowl. In the summertime in New England, screens are important, especially in blackfly country. Last night, screens were again important in New England, even though it's the dead of winter. 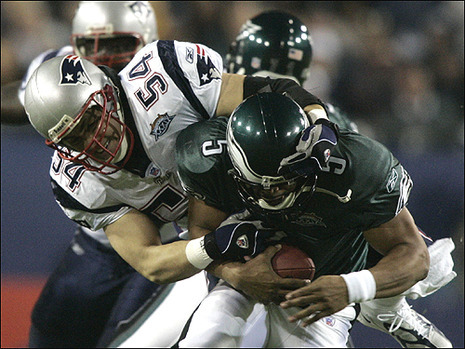 The New England Patriots used the screen pass to nullify a swarm of nasty blackflies called the Philadelphia Eagles, beating a blitz that was pressuring Tom Brady and forcing New England into some uncharacteristic mistakes and penalties through much of the first half of Super Bowl XXXIX.